Over the years, I have taught (and helped teach) close to 250 floral designers and enthusiasts. The question I hear most regularly is about the backside of the arrangement or installation...the mechanics behind the flowers. Even as a kid learning to bake, I learned that if you don't have the right tools and preparation, it's just not going to end up well. It's true in life and it's especially true in the floral industry. An arrangement has to have good bones; good enough to withstand transport to a venue, not to mention an evening of guests dancing around and probably bumping into. That's why I designed this workshop. It's all about the mechanics. A workshop on Nantucket Island? Well, I figured if I was going to host my own workshop, I might as well host it in my favorite place in the world. While I live in DC, Nantucket has my heart. It's where I feel most like myself. It's where my eldest son Jack took his first steps. It's where I visited with friends who are no longer with us. It's where I can think and breath and create. That's why I want to share it with you. The recipe for an unforgettable workshop: an absolute overload of gorgeous, locally grown flowers, a newly rennovated historic home, friends, good food, and a boatload of information. Email me at Hello@WhiteMagnoliaDesigns.com if you have any questions. And, if I have taught you in the past, feel free to leave a comment below about your experience. Starting a new arm of my business, because there is a need is really only part of the equation. Here's the real reason: after really considering it, and weighing the failure/success possibilities it felt like it was exactly what I was supposed to be doing right now - challenging myself and continuing this journey of reinventing myself as I step closer to being an empty-nester. Geez, I hate that term. Courage. Investing your time and money. Putting yourself out there. Deciding to thrive, even if it means failing. It all takes courage. Enter the fear, the nay-sayers and the static, of which my internal voices are the loudest. So, here's what I did: I started by getting really quiet and asked myself what was I really afraid of? Rather than allow that fear to freeze out my passion, I went back to this basic belief: If I am doing what I love, doing what makes me feel alive, it is worth the risk. So, let me introduce you to Floral Design Solutions, where I design, manufacturer and wholesale products that help make floral and event professional's lives easier. I have a number of products in development, but the flagship product is a glass candle chimney/hurricane that provides a cover for taper and pillar candles with live flames. (An open flame in a public venue does not fly with the fire marshall in most cities.) 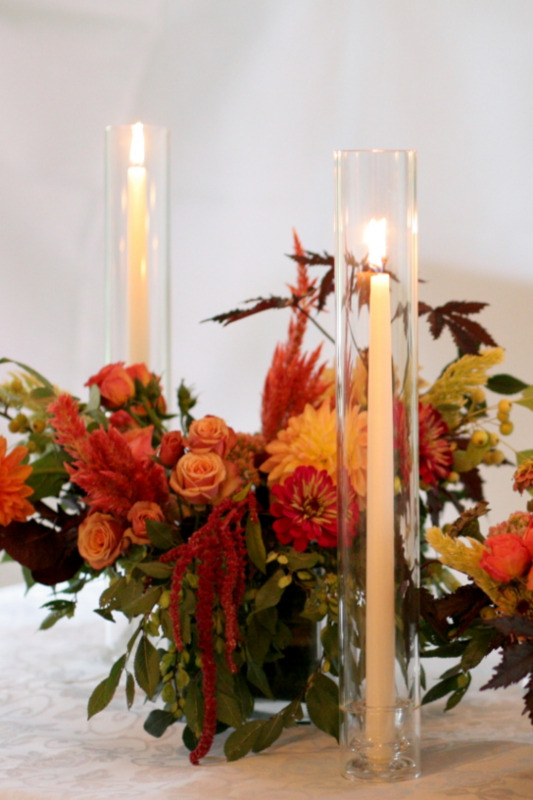 Floral Design Solutions' Taper Candle Hurricanes and Pillar Candle Hurricanes give designers the ability to provide clients with real clandlelight at their weddings and events. In addition, the hurricanes can be a great source of rental revenue and offer some serious up-sale possibilities. So, that's what I've been starting. A new company. A new opportunity. A new way to exercise my courage muscle called Floral Design Solutions. Hop over and take a look. I would love to know what you think! Don't let "You're fired" put out the flame. I know. Super corny title. But it's exactly what set me on the "If I'm gonna do this, I damn-well better do it well" journey. One of the arrangements that got me fired. Ok, so it was my first big paying job. The wedding was in 3 months, and the engagement party was that night. The truck was loaded, I was right on schedule and my stomach was about to explode from the butterflies. I did it! And, the arrangements looked gorgeous! "Wait, you hate the flowers? You HATE them?" Lesson learned: People speak different languages, even when they are speaking the same language. Pull out your portfolio. I know. I know. They called you. They told you they looked through your web site and loved your work. Pull it out anyway. When they request "garden-inspired, loose and wild" be sure you have the same idea of what that looks like. They hated the flowers, and my services were no longer required for the wedding. Shame. That was my knee-jerk reaction. Maybe because I was so new at this? Regardless, that was how it felt. Response A: Wonder what the hell is wrong with my eyes? How could I possibly have thought those arrangements were beautiful? And by the way, who am I to think I could re-invent my life and start a career after having been at home with my kids for all of those years? For me the Flower Doctors were Ariella Chezar, Sarah Rhyanen and Nicolette Owen. Your Flower Doctors may be different. So many amazing American designers have emerged as being willing to share their design secrets and knowledge. Kate Holt, Sarah Winward, Erin Benzakein, Amy Merrick, Amy Osaba, Jennie Love, and Françoise Weeks are some of the big dogs. And, there are so many more! Just a quick Google search for floral design classes turns up pages of options. Do it. Go see your Flower Doctor. Learn. Build your confidence. Quiet those voices and lose the fear. It allowed me to develop my own voice, my own design style and gave me the confidence to build my business. Who cares if you get fired or screw up or make a mistake. We all do. All of us. Get over yourself and don't allow someone to extinguish the excitement you feel for this art. Because that's exactly what it is. Art, with so many different styles and techniques. There is no accounting for taste, but when you start with beautiful flowers, and lots of them, how could it not end up being beautiful?